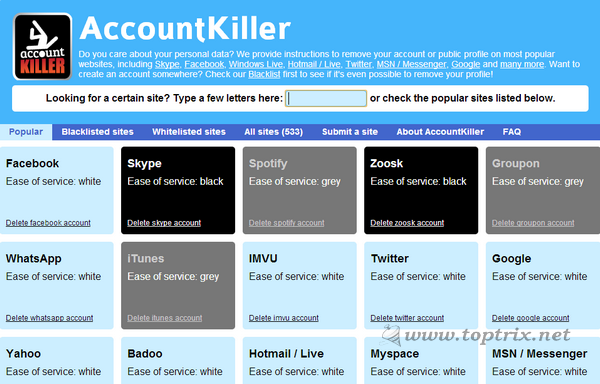 Many online services, websites, do not have the 'Delete Account' option if a user wishes to. You provide complete personal information, and then if you didn't find the service useful, you have no choice to delete your complete account and personal information from that particular website. In this scenario, Account Killer comes to your help. It is a great database service. It does not require you to create a new account or sign up. It has information about more than 500 famous online services and websites. Just find the service you wish to delete the account for and if will give complete instructions about completely deleting your account. It has information about a wide range from Facebook, Google, Skype, Twitter, Groupon, Yahoo!, Hotmail, MSN, eBuddy, 4Shared and many many more. The web services are categorized according to their easiness to delete the account like Black, Gray, and White. Black sites require more work and it is hard to delete the account but you can. 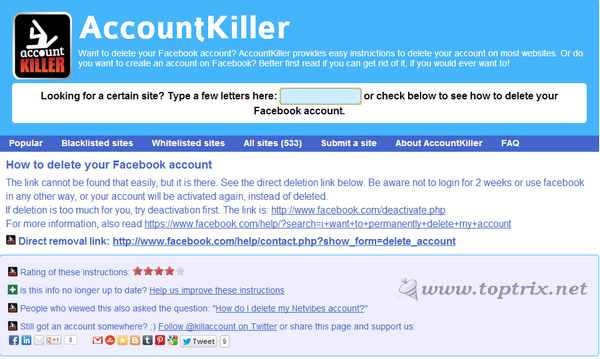 On the other hand White site provides a very easy way to delete your account. Gray is in between Black and White. This information can be useful if you are going to sign up for any new service. 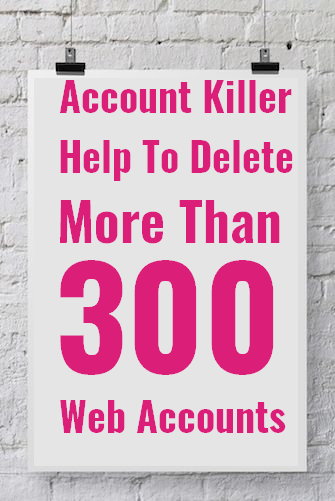 When you click on any particular website, Account Killer provides step-by-step instruction to delete accounts and also give direct like to go to that particular web page making it easy.